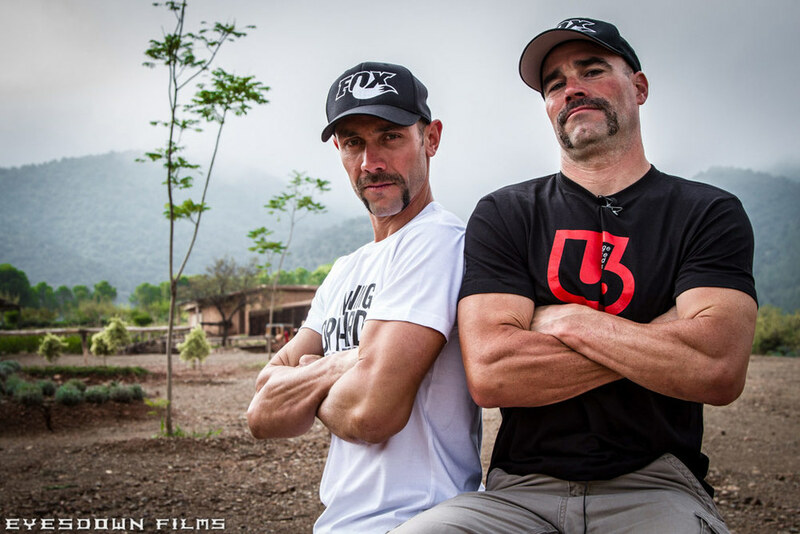 Part Three of the Morocco Trail diaries just dropped with Weir and Barel. The mo's are getting thicker and the riding is just as fun as the last two videos. Watch them all here. A mountain that's 20km away can look as smooth as a billiard table. So what looked like it should have been a short stroll up a reasonably steep golf course from our breakfast table on day two turned out to be an attempt at Jbel Erdouz, a ‘proper’ 3600m mountain on day three! The bit that looked like a golf course turned out to be a 45-50° boulder field with no real path and brush and thorns tough enough to scratch paintwork. It’s said that a camera can’t adequately convey the steepness of terrain or the depth of the experience, but when you have riders of the calibre of Mark Weir and Fabien Barel one-footing it down through the scree and the brush, you know it’s steep! Look out also for the dirt and small stones being thrown up by the tyres and blown sideways! This was proper mountain environment where the boys were glad to get down with the only casualty being a rear derailleur. Although the Trail Diary gang were quite literally blown away by the big mountain experience, they were glad to get back on the road looking for a more relaxed, flowy trail in the grey earth area on the way to the final stop in Marrakesh. Poor Fab’s face when the monkey guys ambush him is priceless! Part two of the the Mojo Trail Diaries just went live on Vimeo. I forgot to post the first one last week so here you go, part one and part two. It's not a time vampire at all and most definitely worth a watch. Part Two intro: The Mojo crew have taken Mark Weir and Fabien Barel to Morocco to explore the boundaries of the ‘Mojo Trail Diary’ philosophy. We have always been interested in pushing (sometimes literally!) the trail less travelled and taking the bikes back into the mountains, but for part 2 of the Morocco trip we really got into the backwaters of the Moroccan Atlas. The lads learnt a lot about the ‘Rocc’ in Morocco (no comforting, deep loam berms here!) and about the best way to build a trail out here! It turns out that the mules have bedded in some of the most awesome trails in the mountains - they have put in awesome curves, switchbacks, steep pitches and off camber contouring sections seemingly without access to IMBA guidelines! The Mojo Trail Diaries were intended to show people how capable the modern trail bike has become - to encourage people to spread their wings and try something new, the bike and suspension won’t hold you back! In the previous edits in the series we climbed hills, munros and mountains, hit jump spots, slippy and grippy singletrack and rocky scree fields. We’ve had Aaron Gwin, Fabien Barel, Steve Peat, Guy Martin and even web susperstar Danny Mackaskill! During the ‘England, Wales and Scotland’ edits we’ve subjected those boys to wind, rain, sleet, snow, fog and basically bikes and riders have always come up trumps. There is nothing we could throw at the modern trail bike that it could not do! So where do we go now to show the riders who may be stuck in a rut a new way to get out of it? Not Whistler! Let’s go to Africa? More specifically Morocco’s Atlas mountains! Mark Weir, Fabien Barel and the Mojo van are already at the Trans Provence the week prior to our plan, ChrisP is riding around Spain on his touring motorcycle? So everyone’s already halfway there right? Ferry strikes, unplanned Chunnel journeys, biblically wet weather in France and Spain, flights via Madrid, Nice and Casablanca, lost luggage and a final Mojo van dash from Malaga to Marrakech in a day via Algeciras/Tanger! What could go wrong?